Yesterday I finally had the chance﻿ got motivated enough to go around and check out some of the Secret Recipe Club Group C reveals from the December reveal. Wow! There were some great posts - what a talented group of people. Some of my favorites were Saltine Cracker Toffee over at Allie's Clean Plate Club, Salmon Creme at the Kitchen Witch Blog, and the Chocolate Peppermint Brownie at Foodness Gracious. But I think my absolute favorite of the bunch was the Apple Cider Pork Chop Sammies with Apple Slaw over at Cookin with Moxie, in fact, I was so excited about these "sammies" that I just had to make them last night for dinner! It was sooooo worth it! The house smelled amazing, they were quite easy, but the only thing they weren't was quick. The key to the deliciousness of these sammies is the slow simmering of the pork chops. I tweaked the recipe a bit, and I think I will tweak it a bit more next time I make it (because there will most definitely be a next time when I'm through with all these turkey leftovers!!). Here is the recipe, because I can tell you're dying to give it a try. I've noted the changes (though there aren't many) that I will make next time I make it in blue. Sprinkle pork generously on all sides with salt and pepper. In a large heavy bottomed, deep skillet, over medium high heat, add the olive oil and sear the chops on all sides. Remove to a plate while searing batches of the pork until all pork has been browned (work in batches to prevent over crowding the pan - overcrowding the pan results in decreasing the temperature of the pan and then boiling your pork instead of searing. We want to sear to ensure that we develop those delicious caremlization flavours!!). Turn the heat down to medium and add the onions. Sweat for five minutes, then add the garlic and sweat for five more minutes. Deglaze the pan with the apple cider and the beer. Scraping the brown bits from the bottom of the pan. Add pork chops and any juices that have accumulated back to the pan. Add the thyme. Cover and bring to a simmer. Simmer for 1 1/2 hours or until the pork is falling apart. Remove the pork from the liquid with a slotted spoon and shred with two forks. While the pork is cooking, make the coleslaw. Whisk together the mayo, cider vinegar, celery salt, and both mustards. Taste and season with salt and pepper if desired. Add coleslaw mix and shredded apples. Toss thoroughly. To assemble the sammies, place a generous scoop of coleslaw on one side of the bun, place a generous scoop of the shredded pork on the other side of the bun. 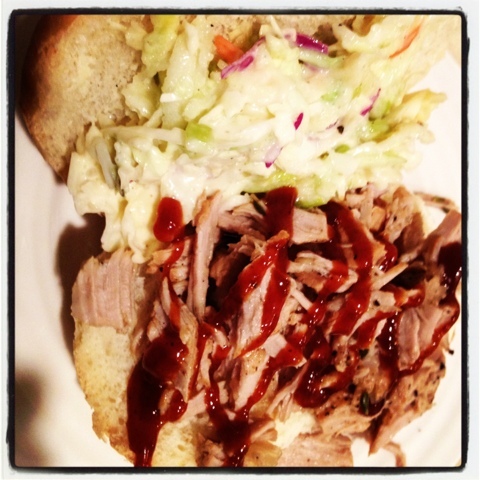 Then drizzle the pork side of the bun generously with your favorite bbq sauce. Enjoy a sloppy, but delicious dinner! Welcome Mary! So glad you've enjoyed browsing around. :) Hope you enjoy the recipes you try from my blog!! See you again soon.